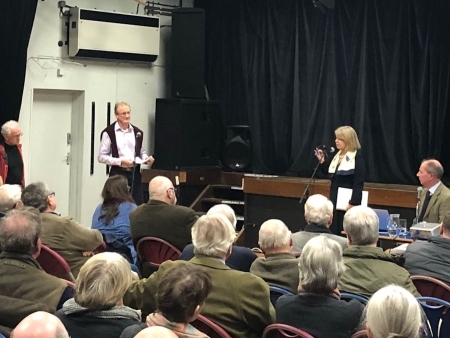 More than 100 people turned up to hear West Worcestershire MP Harriett Baldwin set out the Government’s position on the Brexit agreement ahead of a vote in the House of Commons next week. The MP set out the detail on the Withdrawal Agreement and took questions from local people at the meeting at Malvern Cube on Friday night. People from all over the MP’s West Worcestershire constituency filled the main hall at the community centre as Harriett set out the agreement and her decision to support it during votes in the House of Commons next week. Harriett commented: “I am grateful so many people took the time to attend and listen carefully to the detail on the agreement and how I took my decision to support this outcome. “This was not a chance to re-run the referendum. It was a discussion about where we go from here. “The audience consisted of people who have been in touch with me about their favoured solution. I know I am not going to be able to please everyone. Photo: Harriett Baldwin MP answers a question from local businessman Guy Bryan Brown (left) with event chairman Michael Hodges (seated, right).